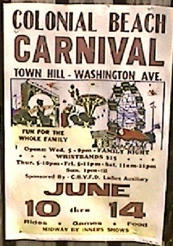 Carnival - Coming June 6th! 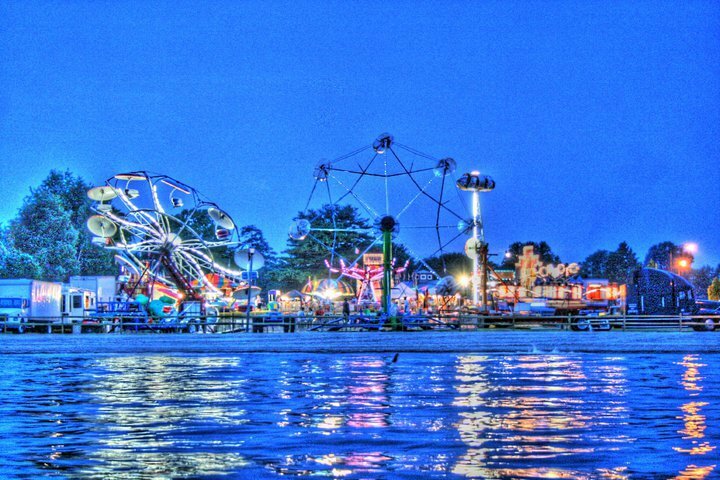 Sponsored by the Colonial Beach Volunteer Fire Department Ladies Auxiliary, the annual carnival is a great part of the Potomac River Festival and lots of fun for everyone. 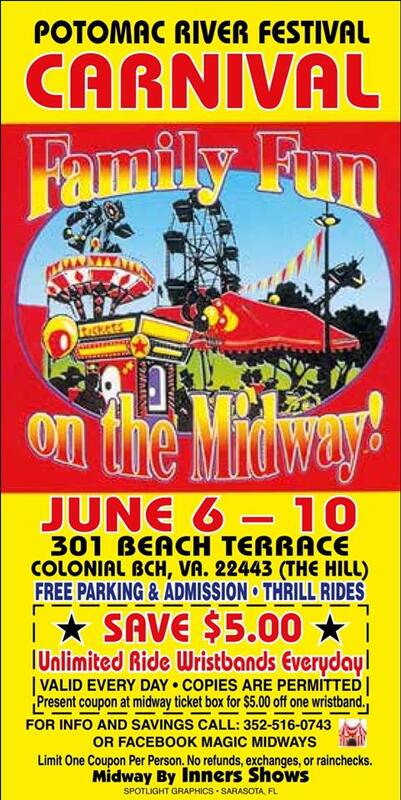 Town Hill is the place to be the second week in June. 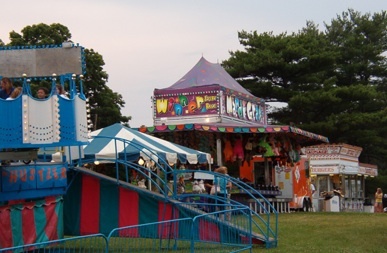 Bring friends and family and enjoy a great time on the chair swing, hi roller, giant slide, ferris wheels and all the other rides, or try playing one of the many arcade games. Win a teddy bear for your sweetheart! And, don't forget all the great foods! 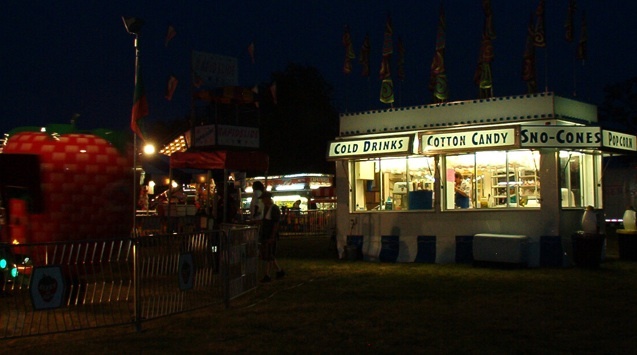 Everything from funnel cakes to cotton candy to corn dogs and you can wash it all down with some cool lemonade or other refreshing drinks. 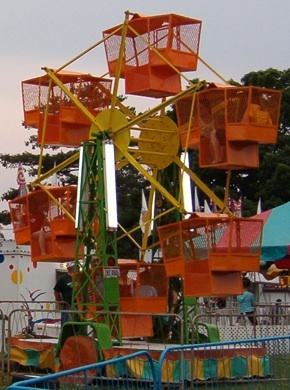 This is the smaller ferris wheel. 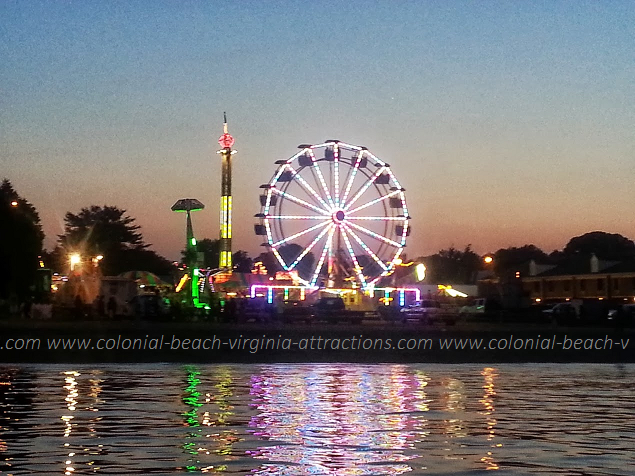 You can get a fabulous view of the Potomac River from the top of the giant ferris wheel which is usually set up next to the Boardwalk. Here's a shot of it at dusk, taken from a boat out on the river. 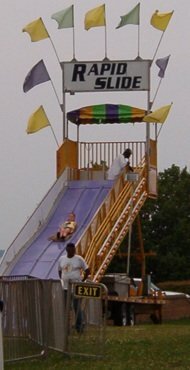 Carnival in 2013 as seen from the water. For a real treat, visit at night time and see the place all lit up, it's so pretty! 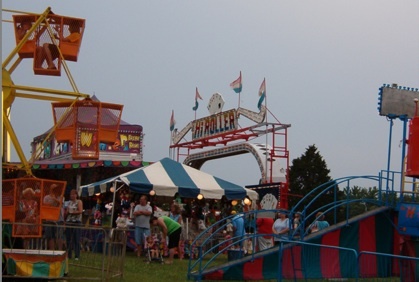 Opening night (Wednesday) is usually Family Night and admission wristbands can be purchased for a flat fee. Hours for this day are usually 5 - 11 p.m. It opens around noon on the other days. It runs daily through Saturday, sometimes all the way through to Sunday afternoon, which is the last day of festival weekend. There's free parking available onsite and nearby. On weekends, you can ride the Town Trolley. It only costs 50 cents per person and there is a stop right at the entrance to the event area.